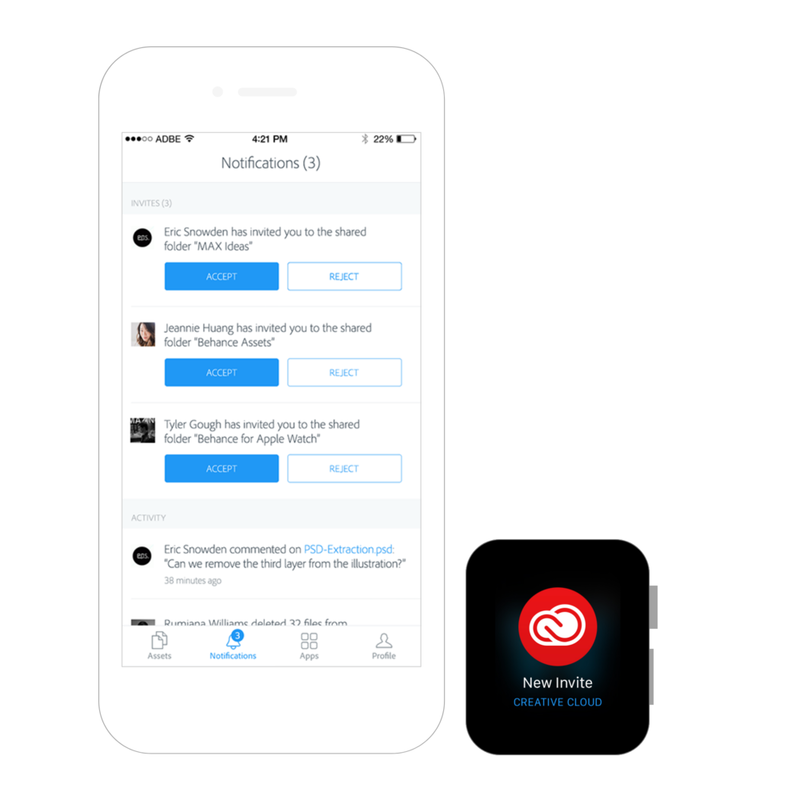 The watch app lets subscribers receive, view and respond to comments on their work. Get notified when someone invites you to a folder and accept directly from the watch. Review file and library activity on your account. The watch app is an extension of the CC iOS app which gives users access to their creative files, let's them give and receive comments, get invites to folders and also have access to account information. Prior to the Apple Watch launch the Creative Cloud team examined which features of the app are best suited for the Apple watch. Since major features are collaboration and notifications, we started developing the app based on the extensive documentation provided by Apple. After the launch of the watch and while spending more time with it, we realized that some of the features that we had developed are probably not as useful as we initially thought. In the next iteration of the Watch app we removed anything that was not timely. In the initial design there were four main areas: Activity, Invites, Comments, and Profile. Short Look / Long Look Notification for a New Invite. A detailed notification with the ability to accept or decline an invite for collaboration. Comments are key feature of the watch app. New and old comments are displayed chronologically. In a detail view the person who commented is shown as well as when the comment occurred. Comments can be replied to directly from the watch app. Some key phrases are preselected. Or the response could be recorded. Profile information is available on the watch. A subscriber is notified when storage nears capacity.